A version of this article originally appeared in Guns Review International, February 1996. Last update 25 September 2010. The history of British military rifle cartridges in the twentieth century was not a happy one. At the beginning of the century, the .303 inch, one of the first of the small-bore military cartridges, had been in service for a dozen years and was already being criticised as obsolescent and inadequate. Attempts to introduce a satisfactory replacement were initially stymied by the onset of World War 1, then in the interwar period by a lack of resources, and finally - twice - by demands for NATO standardisation. As a result, British troops throughout the century and up to the present day have been equipped with small arms using cartridges which have been less than ideal. Ironically, one cartridge which did see limited British service early in the century could have made a much better basis for military small arms than anything which has seen service since; the Japanese 6.5x50SR (popularly known as the 6.5mm Arisaka), designated in British service "the .256 inch". The .303" cartridges in service early in the century were of various Marks, some with a hollow point to improve stopping power (withdrawn soon afterwards as they contravened the 1899 Hague Convention which banned expanding bullets), but all had heavy round-nosed bullets fired at a low muzzle velocity. The performance of the .303" Lee Enfields in the Boer War of 1899-1902 was regarded as unacceptably inferior to the relatively high velocity 7mm Mauser weapons of the Boers, as the open country of the South African plains favoured a flat-shooting, long-range rifle. As a result, work began in 1910 on a replacement, suitable for long-range rifle fire, which emerged in 1912 as the .276 inch Enfield cartridge, chambered in the new "Rifle, Magazine, Enfield .276 inch Pattern 1913" bolt-action rifle - a modification of the well-known Mauser rifle. The cartridge was impressive and had performance to match; not far short of present-day 7mm Remington Magnum ballistics. Not surprisingly, troop trials in 1913 revealed problems with excessive recoil, muzzle flash and barrel wear and overheating. Attempts were made to find a cooler-burning propellant, but further trials were halted by the events of 1914. As a result, the .303" was retained in service, albeit in the much improved Mark VII loading with a lighter, pointed bullet and a higher muzzle velocity to provide a better long-range performance and, like other pointed bullets, a tendency to yaw on impact magnifying the wounding effect . This remained the standard rifle ammunition until the .303" was replaced by the 7.62x51 NATO in the mid-1950s. At this point of the story, the .256 inch British makes its appearance. Early in World War I a considerable shortage of Lee Enfield rifles occurred. As a result, the UK purchased no less than 130,000 Japanese Arisaka service rifles of assorted types, all in 6.5x50SR calibre, a designation Anglicised into .256 inch (representing the bore diameter). These were mainly used for training and home defence but were also issued to some naval units. From 1916 they were all shipped to Russia, and it appears there were none left by the end of the war. The rifle was a conventional, if rather long, bolt action weapon, but the cartridge had an unrecognised potential which we will return to later. It was fortunate that the .276" Enfield was not adopted, as even the .303" proved unnecessarily powerful for the predominantly short-range trench warfare of 1914-1918. By this time, a further problem with the .303" was becoming obvious; the rimmed case design was not well suited to most fully-automatic weapons. Much experimentation with semi-rimless and rimless cartridges took place between 1917 and the late 1920s to no avail. Despite considerable interest being shown in the (subsequently cancelled) American Pedersen rifle and its relatively low-powered medium-velocity .276" ammunition (which would have been well-suited to automatic rifles), the combination of severe economic problems and vast quantities of standard .303" weapons and ammunition in store after the First World War militated against the adoption of any new calibre. The 1930s rearmament programme therefore saw such weapons as the American Browning aircraft machine gun and the Czech ZB30 (better known in its British incarnation as the Bren Gun) expensively redesigned to fire the rimmed cartridge. Experience in the Second World War reinforced the point that Britain’s standard rifle ammunition, in common with that of other nations, was unnecessarily powerful for most engagements. It was capable of shooting accurately out to 1,000 yards (and ranging out to over 4,000 in the streamlined Mark VIII version for the Vickers Machine Gun), yet almost all fire-fights took place at less than 300 yards. This might not have mattered, except that the advantages of fully-automatic fire in rifles had also become obvious, and this was not feasible with full-power military rifle cartridges because their heavy recoil made automatic rifle fire uncontrollable. The 1939-45 conflict saw both the acceptance of the sub-machine gun as an important military weapon and the introduction of its eventual replacement; the assault rifle. The need for a weapon with the automatic fire of a submachine gun but the range to cope with most infantry engagements was first realised in Germany. This led to the introduction of the MP44 Sturmgewehr (assault rifle), firing a new 7.92x33 Kurz (short) cartridge with a performance intermediate between the standard 7.92x57 rifle/MG round and the 9mm sub-machine gun cartridge. The Soviet Union soon followed suit with the 7.62x39 M1943 round, due for international fame in the Kalashnikov AK and AKM assault rifles but also used in other weapons including light machine guns. After the Second World War, both the USA and the UK gave much thought to the introduction of new small arms cartridges. The British, together with Belgium and with the support of Canada, developed a 7x43 round (also known as the .280" and, in slightly modified form, the .280/30") and the associated EM-2 "bullpup" assault rifle, similar in configuration to the current 5.56mm L85A2 Army weapon. The calibre, bullet weight and muzzle velocity were carefully calculated to combine the low recoil necessary for automatic fire with a sufficiently long range to replace the .303", by all accounts successfully. The compact bullpup layout was chosen so that the EM-2 could replace the 9mm Sten SMG as well as the Lee Enfield rifle. The US Army also produced a smaller round to replace their .30'06 and as a competitor to the British 7mm for the standard NATO small arms cartridge, but appeared to suffer from considerable confusion over the purpose of the new round. They decided both to retain the .30" calibre and to provide sufficient power to replace the .30'06 in machine guns, thereby ensuring that the new cartridge was too powerful for an assault rifle. Selective fire was provided in some rifles, but the recoil made automatic fire uncontrollable. 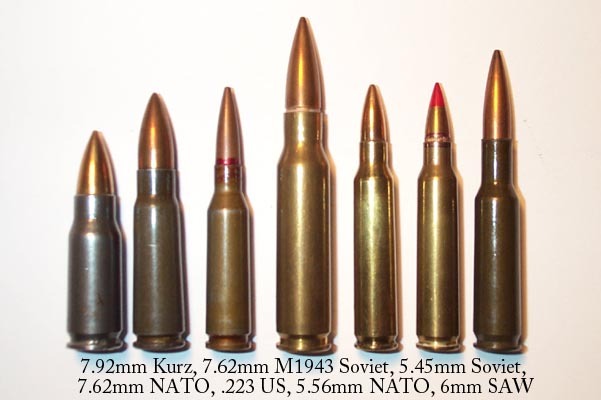 The 7mm supporters protested but American military and economic power prevailed, saddling NATO with the 7.62x51 NATO cartridge which was no real advance over the 50-year old 30'06. Having committed NATO to a cartridge too powerful to permit the development of assault rifles to match the Kalashnikov, the US Army decided as a result of experience in Vietnam that it had made a mistake and went to the other extreme in adopting the .223" (5.56x45) round for the M16 assault rifle. This acquired a controversial reputation in Vietnam, with tales of the devastating effect of the high-velocity bullets conflicting with other accounts criticising the lack of range and penetration. As a result, the 7.62mm NATO remained in US service and has indeed experienced a revival in recent years since the 5.56mm has proved unable to cope with the long-range engagements common in Afghanistan. Other NATO countries began to consider replacing the 7.62mm (at least in the standard infantry rifle) in the 1970s, and a competition for a new cartridge was held. 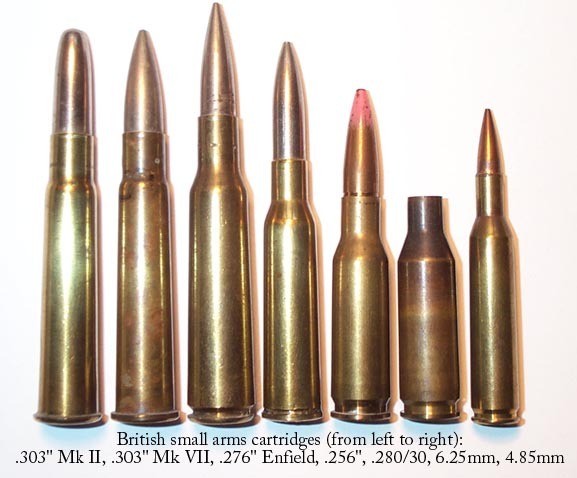 The British proposed a 4.85mm round but ensured that it was based on the 5.56mm cartridge so that the weapons designed for it could easily be converted in the event of the US cartridge winning the NATO competition; which (to no-one’s surprise) it did. Since then, much further research into future military rifles involving such exotic concepts as caseless ammunition and flechette (steel dart) rounds has taken place but it seems that the 5.56mm NATO may be with us for the foreseeable future, supported by the 7.62mm where more range or hitting power are required. So where does the .256" British fit into this? The answer lies in a series of experiments conducted by the British and Americans to discover the ideal military small arms calibre. In the late 1960s, the Royal Small Arms Factory at Enfield began a detailed theoretical analysis of the striking energy needed to disable soldiers with various levels of protection, and the ballistics required to deliver that energy at battle ranges for a number of different calibres. The conclusion was that the optimum calibre would lie between 6mm and 6.5mm, and an experimental 6.25x43 cartridge (based on the abortive 7mm round) was developed which was claimed to have significant advantages over both the 5.56mm and 7.62mm calibres. Performance proved to be virtually equal to the 7.62mm at up to 600 metres, with recoil and ammunition weight much closer to those of the 5.56mm. At the same time, the US Army realised the need for a light machine gun with a longer effective range (out to 800 metres) than the 5.56mm cartridge could provide but appreciably less weight than the 7.62mm M60 MG. Their research led to the development of the 6mm SAW (Squad Automatic Weapon) cartridge. A relatively heavy bullet combined with a moderate velocity were selected for the optimum long-range performance. In the event, weapons firing improved 5.56mm ammunition were selected instead, largely to avoid the supply problems created by the use of three small-arms calibres. More recently, the US firm of Alexander Arms has introduced the 6.5mm Grendel, a cartridge which matches the 7.62mm NATO in its long-range performance with much less weight and recoil. Returning to the .256" British, it is now clear that the 6.5mm calibre is a much better compromise for a general-purpose military rifle and machine-gun cartridge than either the 5.56mm or the 7.62mm. So why did the Japanese (and most other nations with 6.5mm weapons) develop larger and more powerful calibres in the 1930s? This is worth exploring in some detail. The main reason is that cartridges were optimised for machine guns, which in those days were far more commonly used for long-range (including indirect) fire than they are today, with ranges in excess of 2,000 metres sometimes used. So powerful 7.5-8mm ammunition was required, and several rounds were introduced in the 1920s and 1930s specifically to meet this need: the Japanese 7.7x58SR and 7.7x58, the Swedish 8x63, Norwegian 8x57, Italian 8x59 Breda and Austrian 8x56R Solothurn. Sometimes these rounds were also available in rifles (mainly in the interests of simplifying supply), but it is worth pointing out that the Japanese Army's 7.7mm ammunition was available only in machine guns for a decade before it started to be used in rifles. Replacing the 6.5mm in rifles was clearly not a priority. Another reason probably lies in the relatively ineffective loadings used in most 6.5mm cartridges at the time, usually featuring heavy, round-nosed bullets and low velocities. Such bullets not only have poor ballistics but also do not yaw on impact, instead punching a neat hole which causes only minor injuries unless it hits a vital organ. From 1905 the standard Japanese loading (the Type 38) was much better, with a pointed bullet giving good ballistics (interestingly, closely matching those of the 7mm EM-2) and, according to WW2 US Army medical reports, very good terminal effectiveness with rapid yaw on impact causing severe wounds. However, British production of the cartridge concentrated on the earlier round-nosed Type 30 since its ballistics matched the sights of the older Arisaka rifles acquired in large numbers by Russia, to which most of the ammunition was shipped. Confusingly, the Type 38 saw British service first so was known as the Mark I, with the older Type 30 being designated Mark II. The final reason for the emphasis on larger and more powerful cartridges was that the requirement for automatic fire from rifles did not exist until World War 2. As a result, neither did the need to reach a compromise between ballistic performance and the reduced recoil needed for controllable automatic fire. So the potential of the 6.5mm calibre in combining excellent long-range ballistics with moderate recoil and ammunition weight was not recognised. The .256 inch cartridge is not entirely ideal for modern military purposes as it is semi-rimmed rather than rimless, and with modern powders the cartridge case could be smaller and lighter. Nonetheless, its potential was recognised very early in Russia, which used the Japanese cartridge in the Federov Avtomat, a selective-fire rifle first produced in 1916. If it had remained in British service as a supplement to the .303", preferably in a modified, rimless, form and with a lighter bullet at a higher velocity (8g at 800 m/s - 123 grains at 2,620 fps - should have been possible) the .256" cartridge could have provided an excellent basis for a family of light, fully-automatic weapons in time for World War 2, and could still provide a better all-round compromise than the ammunition in service today. Its problem was that it entered British service about 30 years ahead of its time. Further information on the history of assault rifles and their ammunition is HERE.